Arkansas Baptist Disaster Relief stands ready to answer the call when disaster strikes! Donations through Arkansas Baptist Disaster Relief go to serve others in their great hour of need. All the money given through the Arkansas Baptist Disaster Relief goes toward work in current disaster and preparation for future disaster responses. Arkansas Baptist Disaster Relief provides help, healing and hope to survivors in a great time of need. 1. Donate online by credit or debit card by clicking here. 2. By check, made out to the Arkansas Baptist State Convention, memo line "Disaster Relief." A check can be mailed to the address below. Thank you Arkansas Baptist for your willingness to give sacrificially & serve your neighbors in need. 11/7/2018- DR is continuing their operations in Florida with feeding teams, chainsaw units, and shower and laundry units. The Red River feeding team deployed October 28 and will be leaving November 6. They will be replaced the Forrest City feeding team. DR has several chainsaw units performing recovery work this week: Indian Springs Baptist Church, Faulkner Association, Balboa Baptist Church, and Beckspur Baptist Church. The shower/laundry units from Mount Zion and Corner’s Chapel are still on site. They continue to serve the volunteers by providing a warm shower and clean clothes. The Incident Management Team is currently staffed by members of Oklahoma Disaster Relief. On November 10 a team from Arkansas will arrive to take over duties for the next two weeks. DR has had incredible opportunities to bring help, healing, and hope to those in need through this disaster. DR knows that they will be serving in Florida long-term and would ask that you continue to pray for victims affected and our volunteers as they travel to and from Florida. 10/26/2018- AR DR have partnered with Oklahoma Disaster Relief to minister to the people of Bay County Florida. Our Incident Management Team is on site until October 27 when a team from Oklahoma will arrive to relieve them. Our Incident Management Team will resume coordination duties on November 10. They are working with assessors, chaplains, feeding volunteers, chainsaw teams, and shower/laundry teams. Currently, Oklahoma is supplying volunteers to the feeding unit in Panama City. Red River Association will replace them on October 29. The following week the team from First Baptist Forrest City will relieve them. Oklahoma will return after that. We have four chainsaw teams on site: Northwest, Tri-County, Beckspur, and Walnut Street. Indian Springs, Fellowship Bible, and Arkansas River Valley will be going to continue the relief efforts in the following weeks. Mount Zion and Corner’s Chapel shower/laundry units are onsite to provide services to the volunteers during their stay. We have been able to reach 493 people through ministry and 256 people through our chaplaincy program. So far we have seen 11 professions of faith!! We are continuing to reach out to home owners and neighbors, police officers, military personnel, and civilian works during this process. 10/17/2018—As teams from Arkansas begin to arrive and serve in Florida, stories of life change are already coming in. On Tuesday, the Incident Management Team trailer was being set up early in the morning in Panama City. The first family arrived, seeking help. Before the team could get their name in the spreadsheet, the mother received Jesus Christ, quickly followed by her son. God is at work in Florida, and we get to join him in the harvest! Please continue to prayer for our Disaster Relief volunteers as they work in tough conditions and long hours. Pray for their strength, safety and boldness to share the Gospel. In addition, pray for all who will come in contact with Southern Baptist Disaster Relief volunteers and that they will be receptive to the Gospel. 10/15/2018- 01:45 PM- Arkansas is partnering with Oklahoma to provide: IMT, feeding, chainsaw, skid steer, chaplains, and shower/laundry. 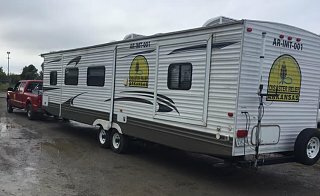 At this time, the ABSC DR response will be with our Incident Management trailer & team, 2 chainsaw teams this week (AR River Valley & a brand new team - Delta Chainsaw), the state skid steer, and 2 shower/laundry trailers (Mt Zion Association & Corners Chapel). Oklahoma will roll their feeding unit and team with AR providing the first meals. Next week, Red River Feeding Team will replace the OK Feeding Team, alternating teams each week. This is first wave response and is very raw. Please pray for the masses of people who are forever impacted by Hurricane Michael! Please also pray for the SBDR leadership who are pushing through exhaustion to discern how best to help people experiencing tremendous crisis. We pray God’s comfort, hope, and love are shared by these teams. 10/10/2018—01:30 PM- Hurricane Michael has made land fall on the coast of the panhandle of Florida. Already a record-breaking hurricane, Michael has sustained winds of 155 mph and catastrophic damage is occuring. As a result, all Arkansas Baptist Disaster Relief Units are being placed on standby in preparation for a response to the Florida Gulf Coast. As needs are determined in coordination with Florida Disaster Relief, the Arkansas Baptist Disaster Relief Director and team will prepare a response from Arkansas. Stay tuned here and to Arkansas Baptist social media for further updates and prayer requests. 9/27/2018- We currently have a chainsaw team & flood recovery team @ Bayboro NC. We plan on sending an additional chainsaw team to NC (location to be determined). We have been asked by Texas Baptist Men to send flood recovery teams to Sonora, TX. The Tri-County Association Flood Recovery team is planning to leave tomorrow for Sonora, and in the coming weeks we plan to send additional flood recovery teams. 9/24/2018- Today the Mississippi County/Corner’s Chapel Flood Recovery Team and Faulkner Chainsaw Team headed to Bayboro, North Carolina. Additional teams are lining up to respond as needed and/or requested. Be in prayer for teams headed out! 9/19/2018- After discussion with states on the east coast, a plan is now in place for Arkansas Baptist Disaster Relief teams to deploy in response to Hurricane Florence. The Mississippi County/Corners Chapel Flood Recovery Team and the Faulkner Chainsaw Team have been activated and will plan to deploy early next week. The current plan for these teams will be to join efforts with the Oklahoma Baptist Disaster Relief team and Texas Baptist Men. As the flood waters recede more areas in need will be identified, and we will send additional teams as requested. Disaster Relief volunteers, please stay connected with your team leader for response activity. Arkansas Baptists, please pray for these teams who will be responding. Pray for their safe travel, strength and endurance while responding, and an openness to the Gospel for survivors of the storm who will come in contact with these volunteers. 9/18/2018- After hitting North and South Carolina Friday morning of last week, Hurricane Florence parked over the coasts of the two states dumping water for several days. While the worst of the storm has passed, the flooding is expected to remain throughout the week. As the storm has moved to the mountains, water will trickle back down, flooding some areas throughout the state. Southern Baptist Disaster Relief teams east of the Mississippi are well seasoned in response and we are grateful and hopeful to serve them in a supporting role in the coming weeks. Due to continued flooding, it looks like flood recovery response will be lengthy, providing all flood recovery and chainsaw teams the opportunity to serve, possibly multiple times. At this time, we have no request for feeding, shower, or IMT unit deployments. Arkansas Baptist Disaster Relief will remain on standby for deployment in partnership with Oklahoma Baptist Disaster Relief, at the request of affected states. Because of the fluidity of Disaster Relief, anything may change at any time, but we will continue forward with updates on deployment arrangements. We, as Arkansas Baptists, want to share God’s love with those affected by this disaster! We ask you to partner with us in prayer for the survivors of this storm, as well as for the first responders who are still on the ground serving. Finally, continue to pray for all disaster relief volunteers who may have the opportunity to share the love of God with those affected! Stay connected with ABSC for more updates. Thank you for your investment and commitment to the ministry of ABSC Disaster Relief!